It’s been an interesting couple of days as I’ve been trying to expand Flight of the Fat Girl’s social media presence; and I have to say a huge thank you to all of those who have liked my Facebook page, and have taken the time to follow me on Instagram for a more behind the scenes look! I’d also like to thank the handful of folks who have followed me on Twitter, which I am pretty new to, so bear with me, and keep the eLove coming! Now that I’ve gotten that out of the way, let’s get down to business! In light of my recent expansion into the realms of social media, I’ve decided this adorable dress from Great Glam (or tunic style top if you’re feeling modest) was the perfect way to honor the occasion! There is something about this dress that reminds me of a retro computer game. The squares mimic the pixelated images I remember so fondly and who could forget the high contrast look of bright color on black!?!? That being said, it’s definitely a modern look with its faux silhouette design and bodycon cut; and let me tell you, it fits like a glove. I’ve kept the accessories simple, since the fabric of this dress alone, makes such a bold statement already, and I’ve gone with an understated black leather wedge from Aldo, a cool silver cuff bracelet from Armani Exchange that really picks up on the square theme, and matte, red nail polish. After these past few days, I’m definitely feeling like less of a square and much more tech savvy; and in this great dress, I’m looking the part too! Now, if only I could just figure out Twitter… Ha. Yay, yay, yayyy!!! 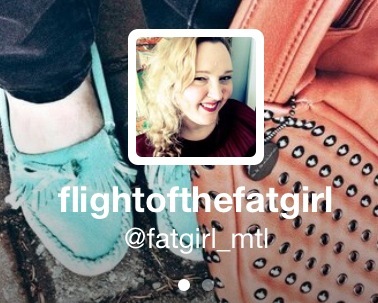 Now you can follow me on Twitter @fatgirl_mtl !!! I’m still learning the ropes but this is exciting! So what are you waiting for!?!? Click here and follow me @fatgirl_mtl on Twitter today or click on the follow button and tweet @ me right here on the sidebar!! !